The aim of this chapter is to outline the central issues of concern in this research, namely how professional female executives perceive and manage their work-life balance. Research has been carried out in Austria, Denmark and the UK, and has focused on women in leadership positions. This chapter first provides a justification for the choice of this research topic, followed by an overview of the research aim and objectives. Finally this chapter provides an overview of the overall structure of this dissertation. At my school, we were told women should learn to think and not cook. I have been brought up on the mantra that we women can have it all: a successful career and a family (Raworth et al. 2009, BBC2). Since women have started entering the workforce, the division of household and organisation of childcare as well as women’s self esteem have changed. While women occupy ever more senior company positions, women still have to maintain their family responsibilities (O’Neil et al. 2005). Therefore, it becomes clear that women have to manage their career and their private life (Zedeck 1992). As a result, studies have investigated the term ’work-life balance’ (Gutek et al. 1991 cited in O’Neil et al. 2005, p169), which means “the stress-free management of work and family roles” (Lobel 1991, p509) and to achieve satisfaction in all life domains (Kirchmeyer 2000 cited in Lyness 2008). a form of inter-role conflict in which the role pressures from the work and family domains are mutually incompatible… (Greenhaus and Beutell 1985 cited in Boyar et al. 2008, p216). Researchers (Drew 2005, Zijlstra et al. 2006) claim that work-life conflicts have negative impacts on physical conditions and satisfaction in work and life, while others argue that work and family can influence each other positively (Mayrhofer et al. 2008). Even if there are different arguments, it is definitely challenging to manage the balance, due to women’s multiple roles, the high energy and time commitment to family and work. In addition to the work-life conflict, “cultural biases, gender stereotypes and attitudes against women” are major obstacles for facing professional working women (Boon 2003, p133). These barriers preventing women from moving into leadership positions have collectively been termed the ’glass ceiling’ (Boon 2003, p132). Whilst some researchers claim that women have broken the glass ceiling (Mavin 2006, Raworth et al. 2009), others argue that the glass ceiling is not the problem, but rather that “women are hampered at each stage of their career progression, which can be viewed as a labyrinth” (Anon 2008, p27). Expressed in a different way, “the sum of many obstacles along the way” (Eagly et al. 2007, p63) prevent women from reaching leadership positions. Whatever the barriers are, it is a fact that there are fewer women in top positions than men (Cabrera 2007, Gatrell 2006). For instance, only seven out of 525 board directors at the biggest companies in Germany are women (FCZB 2003). As a result, most organisational cultures are characterised by competitiveness, zero-sum views of power, and hierarchical relations, where managerial decisions are based on masculine values of rationality, orderliness and conformity to authority (Maier 1999 cited in Cabrera 2007, p220). However, women have made enormous progress in attaining leadership positions (Heffernan 2007) and “it is a common perception that women will steadily gain greater access to leadership roles” (Eagly et al. 2007, p67). Management gurus argue that if companies wanted to have an effective leader, they would have to hire females (Sharpe 2002 cited in Kleiner et al. 2005) and others claim that “more than ever before, the world needs women leaders” (Anon 2008, p27). As a result, the number of women has grown in organisations, but companies are still male-dominated (O’Neil et al. 2008). How can women in senior management positions combine a successful career and family life? Hence, this study focuses on professional working women in Austria, Denmark and England, who have career and family commitments. It aims at identifying key challenges and individual solutions for how women in senior positions can manage their balance in order to combine work and family. In doing that, family, employer and government support as well as the intensity of housework and childcare responsibilities will be taken into account. Additionally, interactions between the company and private environment will be considered in order to explore if there is a connection between work-life balance and working performance. Therefore, in addition to the main question, this study considers the question, if a satisfactory work-life balance influences job performance. 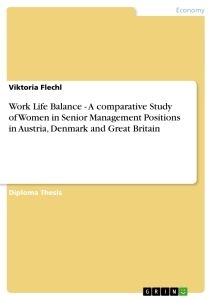 This report is structured into five main chapters and begins by evaluating the existing literature on work-life balance with the focus on women in senior management positions. It discusses changes in family models and the division of housework since the 1950s. Then it focuses on employed individuals and organisations, and finally, on the influence of social policies. The third chapter discusses the research design and adopted methodology to study the challenges of achieving a satisfactory work-life balance. The data was collected from semi-structured interviews with fifteen women. An interview guideline and several predetermined questions provided a supporting structure during the interviews. Finally, the research process will outlined, followed by the consideration of ethical issues. Chapter four presents the findings of the semi-structured interviews with female executives and managers working in senior positions in Austria, Denmark and England. This is followed by the fifth chapter which discusses the findings in terms of family models, companies and childcare. It also answers the research question “how can women in senior positions combine a successful career and family life?” and gives further research recommendations. Chapter six gives recommendations for individuals and for companies on how they can support their employees and develop work-life programmes. Therefore, the model of “3 Principles”, which has been designed and developed by the researcher, illustrates the connections between health, relationships and management, is presented as a mean for suggesting how a satisfactory work-life balance may be achieved through all life-stages. Finally, this study will conclude with a series of recommendations in light of the research findings, as well as some personal reflections related to the experience of interviewing senior female company executives. The purpose of this chapter is to evaluate the existing literature on work-life balance with the focus on women in senior management positions. The aim is to critically review how women combine a satisfying family life and a successful career. Therefore, factors which have an impact on managing the balance will be evaluated. Work-life balance is not only a central issue for individuals, but also for companies and policy makers. Therefore, organisational work-life programmes, as well as social policies will be discussed as key issues for professional working women. The first section will clarify changes of women’s roles from the mid 1950s until the beginning of the twenty-first century. This will be followed by identifying family models and a discussion of how they have changed in the last few decades. Additionally, the influence on the division and organisation of household will be considered. The second section will then provide a closer look at women in senior positions. It will begin by identifying the phenomenon of work-life conflict. Discussion will then progress to focus on women’s needs during their career life-cycle and finally critical resources required to achieve a satisfactory work-life balance will be identified. The third section will cover organisational work-life programmes and discuss flexible working in greater detail. The final section will briefly discuss different approaches of work-life policies, as well as the progression of these policies in Europe, and examine Denmark as a pioneer in this area. Family compositions, as well as labour markets, have changed in many countries since the Second World War. The literature from the 1950s until the 1970s confirms the image of women as predominantly mothers and housewives. In the early 1980s there was a shift in family and household structures across Europe, but the number of employed mothers was still low. By the beginning of the twenty-first century a major change in European society had taken place (Land 1999, Gatrell 2006), where due to anti- discrimination laws, increasing numbers of women entered Universities (Figure 2.1) and there was an increase in highly educated women who continued their career after childbirth (Gatrell 2006, Jones et al. 2006, Edlund 2007). Furthermore, advances in information technology, globalisation and a rise of the service industry influenced societal changes and work patterns (Perry-Jenkins et al. 2000, Major et al. 2006). These changes were most notable in the Netherlands and Britain (Hakim 2000). In 1999, 76 per cent of all professional mothers with pre-school children in the UK were employed (Gatrell 2006, p94). Therefore, women’s and men’s perceptions of partnership have changed as a result of women’s increasing involvement as professionals outside the home (Kasper et al. 2005). The role allocation between men and women was clearly divided before the significant gender role changes emergent during the 1970s. Most couples followed the breadwinner model, whereby the men’s responsibility was to earn money and women had to take care of the household, children and elderly people (Lewis 2001). As a result of the significant changes with the revolution of equal opportunities in the labour market, women acknowledged that they could enter an ever increasing range of employment positions, beyond the more traditional roles as housewives, mothers and part-time workers. On the strength of women’s financial independence changes in family relationships took place (Hakim 2000, Lewis 2001). Rapoport (1969, 1976 cited in Kasper et al. 2005, p442) coined the term ‘Dual Career Family’ (to describe those families characterised by husbands and wives who both took responsibility for working in paid work), which has become a progressively significant lifestyle (Kasper et al. 2005, Hill et al. 2006). Moreover, a recent survey of the European Union reports that only a quarter of European adults prefer to have separated family roles. This shows that people do not accept equal sharing of income and family work (Houston 2005). Even if there is a different set of responsibilities and activities along the gender line (Bailyn 1992), women still perform the major part of unpaid care work (Lewis 2001). As a result, women often have to deal with family issues, even if it hampers their career (Straub 2007). Therefore, it is argued that women’s work-life conflict is more a mothers’ working issue (Hill et al. 2006). While the male-breadwinner model has been replaced by the dual- breadwinner model (Lewis 2001), women as breadwinners are still a minority (Raworth et al. 2009). In Britain for example, only forty per cent of all women are the main earners in the household. The ideal family model has been critically discussed in the literature. Hakim (2003) identified three ideal family models; namely the egalitarian, the compromise and the segregation family models. In this context it has to be said that the compromise arrangement is regarded as the most elected model. However, Hakim (2003) argues that individuals have to focus on their personal preferences in order to identify the ideal model. The European Commission pronounced the Scandinavian model as the ideal family model, whereby all adults work throughout life with a brief childbearing interruption and childcare is mainly undertaken by the public sector (Houston 2005). Moreover, women have to understand that it is not about motherhood, it is about parenthood. Researchers identified the new trend that young fathers want to take paternity leave (Holter 2007, Johansson and Klinth 2008). As in the past, Scandinavian countries play a pioneering role and the current Danish model allows parents to split up the parenthood (Syndikus 2009, Figure 2.2). As a result, it becomes clear that also fathers’ careers are influenced by the childcare which would mean at the same time that mothers become more attractive as employees. It becomes clear that there are several approaches, but none of them can be identified and approved as the ideal family model for the modern society. Hakim (2000) and Hofstede (2001) pointed out that individuals have to choose between personal and general societal desires, and personal objectives and public beliefs to identify their ideal model. Most researchers define housework as unpaid work to maintain the family home and contribute to the family wellbeing. While the number of women working for payment has increased, women still take the primary responsibility for unpaid work such as childcare and household labour (Eagly et al. 2007). Research indicates that on average, women perform 60 per cent of the household labour (Hakim 2003, Lee 2005). While women’s role in the labour market has changed significantly, the pattern of combining household labour and work among men is less evident (Lewis 2001). Hence, how much time women can spend on the job, depends on how men and women divide housework (Perry-Jenkins et al. 2000). Even though dual-earner families appreciate the second income, they often find it more difficult to organise housework and childcare, than families who follow the single-breadwinner model. As a matter of fact, dual-earner families often outsource labour-intensive household tasks (Stuenkel 2005). Stuenkel (2005, p252) terms outsourcing of household labour as the ’commodification of household services’, which is particularly attractive to dual-earners who have the financial resources, but have a lack of time, energy and/or interest to run the household. Commodification of household services is a sensible strategy which helps couples to combine paid employment and family issues. Except for childcare, household tasks such as cleaning, cooking and shopping are often outsourced. This improves the quality of family life and especially helps women to spend more time with their children and husbands, which gives them the possibility to experience fulfilling relationships. a form of inter-role conflict in which the role pressures from the work and family domains are mutually incompatible in some respect. This is, [where] participation in the work (family) role is made more difficult by virtue of participation in the family (work) role (Greenhaus and Beutell 1985, p77). Hansen (1991) found that causes for work-life conflicts are multiple roles and value discrepancies, with the former being the most documented case of pressure. Greenhaus and Beutell (1985) claimed that work-life conflicts increase when people have to perform multiple roles, which often lead to overloads and interferences. Hence, professional women often experience a role overload, due to high energy and time requirements and the commitment to family and work (Duxbury et al. 1994 cited in Straub 2007, Christensen 2005). Researchers have identified that multiple roles often increase stress levels and/or degrade psychological wellbeing and family relationships, especially parent-child and husband-wife relationships (Perry-Jenkins et al. 2000, O’Neil et al. 2005, Schneider and Waite 2005). Additionally, people may be involved outside their work and family roles such as community roles (Jones et al. 2006), therefore the term ‘work-life integration’ (Lewis 2003 cited in Jones et al. 2006, p2) is more appropriate than ‘balance’. Some researchers argue that having many different roles has a constructive impact such as “positive spill over effects on work from parenting, recreation, and community involvement” (Kirchmeyer 1992, 1993 cited in Marks et al. 2001, p1084), which is confirmed through examples within the literature (Fredriksen-Goldsen and Scharlach 2001 cited in Harris 2004). According to Lobel (1992) potential work-life conflicts can arise when values in work and family roles are diverged. Either, personal and organisational values are different or individuals are negatively influenced by external factors. Nevertheless, he argues that significant problems would only arise if the boundaries cannot be maintained. Gutek (et al. 1991 cited in Lobel 1992) and Cooper (et al. 1992 cited in Marks et al. 2001) focused on how work and family interfere with each other. Gutek (et al. 1991) report that in terms of this bidirectional model, women and men have more interference from work with family. The fit between individual and organisational values is seen as an important factor for managing a satisfactory work-life balance. In order to reduce work-life conflicts, Lobel (1992) suggests reinforcing work and family roles with similar values. Either, individuals can contribute to a good fit, if they change their own values in order to equalise them with organisational values, or companies are willing to change their values through cultural changes. If no party is willing to adopt or adapt their values, individuals can respond to a mismatch by leaving the company. It might be that a person can reach a work-life balance by separating identities physically, temporally or psychologically, or by applying consistent personal values for all roles. Career development is defined as a ’lifelong process’ (Hall 2002, p12) of work-related activities (Greenhaus et al. 2006). Therefore, a career consists of different stages, and varies in work and family demands (Higgins et al. 1999). The literature reinforces the view that work-family conflicts increase when women become mothers. Parents with children under the age of six have the highest level of work-life conflict. However, it is claimed that many conflicts will dissolve with the increasing age of the children. Hence, people have different needs and their requirements will change over time (Bailyn 1992, Winn 2004). According to Drew (et al. 2005) senior management career life-cycle and women’s life-cycle patterns of work and family are completely contrary. O’Neil (et al. 2005) identified three career stages, which are idealistic achievement (ages 24-35), pragmatic endurance (ages 36-45) and reinventive contribution (ages 46-60). Women often give birth at the first stage, when there is an intensive workload and the commitment to the company is necessary to achieve a successful career. In order to better fit into the senior management career life-cycle, women follow the strategy of having their children when they are younger; before starting their career or waiting until they have established their career (Higgins et al. 1999). In general, women in senior positions have fewer children than professional men, or they decide to have no children at all (Drew 2005). Drew (2005) also argues that the senior management culture is designed for men and has a negative impact on women’s careers. Therefore, professional working mothers will face difficult circumstances when they try to combine motherhood and an ongoing career (Gatrell 2006). Moreover, women often have to cope with discrimination because of their maternal status, additional family responsibilities and gender stereotyping of the managerial position (Guerrero 2004, Gatrell 2006, Schein 2007, Mayrhofer et al. 2008). Hence, women often face unfair treatment in their paid work, but professional women demonstrate a strong career orientation (Gatrell 2006). Work is an important activity to develop oneself and it is also a source of social recognition (Mayrhofer et al. 2008). Therefore, most women prefer an adaptive lifestyle (69 per cent in the UK), which means that they balance work and family. Work-centred women are frequently childless, whereby this group is relatively small and home-centred women are the minority (Hakim 2003). Housework leaves women feeling emotionally unsatisfied and less work-family balanced (Christensen 2005). On the other hand, women often decide to pursue paid work, because it gives them intellectual satisfaction (Schneider and Waite 2005). Moreover, women reach a greater balance, when they have more hours of paid work, even if they have less leisure time, but they feel free of financial burdens (Marks et al. 2001). Women are achievement-orientated and motivated to succeed and achieve satisfaction in all life domains. In other words, professional women are convinced of ‘having it all’ and want to feel fulfilled (Tom 2004, O’Neil et al. 2005, Lyness et al. 2008, Raworth et al. 2009). Due to the high amount of investment of personal resources in terms of time, energy, and commitment to all areas, women are likely to be successful (Kirchmeyer 2000 cited in Lyness et al. 2008, Mayrhofer et al. 2008). Moreover, women have a sense of purpose and show ambitious pursuits (O’Neil et al. 2005). Time can be seen as a crucial resource, as a result of juggling multiple roles as a professional, wife, mother and community roles. Mothers see the time for their mother-child relationship as very important, and they want to spend time with their children, regardless of how busy they are in their job and with household labour. Mothers make compromises and personal sacrifices instead of disadvantaging their job or children (Gatrell 2006). Moreover, Houston (2005) argues that working long hours is neither beneficial for companies nor for individuals, and having worries about children or elderly people will only increase stress levels. Therefore, companies and individuals should work together to find flexible working arrangements. Energy is a fundamental resource for work and private life. To achieve a satisfactory work-life balance through all life stages, one should have enough energy. In order to have this, measurement of achievement, success and failure is of particular importance (Tom 2004). Moreover, regular recovery is necessary, particularly after intensive periods or difficult challenges. Missing recovery would lead to severe consequences, which could have a negative impact on physiological and psychological health. Sleep is considered as the most important recovery process to humans. A lack or bad quality of sleep can lead to a diminished ability to concentrate, and perform (Zijlstra et al. 2006). Social networks can be identified as a key resource, as different needs require different relationships. People can simplify managing their balance by extending their social network (Marks et al. 2001). Therefore, it becomes clear that the network of relationships comprised of relatives, friends, neighbours and other communities is important (Edlund 2007). Moreover, studies confirm that professional relationships (e.g. with managers or clients, and family relationships with partners, children and other family members), can have a positive or negative impact on women’s careers (O’Neil et al., 2005). The relationship between husband and wife is particularly crucial, as stability is required to achieve a balanced life (Marks et al. 2001, Kasper et al. 2005). Bartolomé (2000) claimed that the most important way for couples to reach stability, is via continuous dialogue about their feelings and needs, as well as spending time together and having fun. Beside the resources in terms of time, energy and relations, selfmanagement is a key factor for professional women. In order to achieve a satisfactory work-life balance, women have to make decisions and set priorities (Bailyn 1992, Hakim 2000, Tom 2004). Furthermore, women have to be clear about the meaning of their careers and about their personal definitions of success, as well as about their relationships between personal and working life (O’Neil et al. 2005, Tom 2004). According to Covey (2004) individuals can only find a balance if they have developed a clear feeling for their highest priorities and live in accordance with them. As discussed in the previous section, poor work-life balances have a negative impact on families and organisations. Researchers argue that company policies and cultural changes can help to reduce work-life conflicts. For example, Boyar (et al. 2008) claims that family-friendly programmes help employees to reach a better work-life balance. Major (et al. 2006), however, asserts that these programmes do not help employees; they solely support business needs such as working long hours. Others argue that it is not guaranteed that family-friendly policies will work effectively. For instance, if mothers go on maternity leave, it has a negative impact on their career (Burke 2006). Common work-life practices are flexitime, part-time working, job sharing, home-working, child care services, and maternity/paternity leave arrangements. A study4 about work-life programmes in Europe (Straub 2007, p294) shows that on average 74 per cent of the companies have implemented different practices. Flexitime is offered by nearly every company (95 per cent) and working from home is also quite common (79 per cent). Only 34 per cent of companies’ provide child care services and 23 per cent give the opportunity to take paid sabbatical leave. While maternity and paternity leave arrangements are few and far between (average 24.5 per cent), companies more often give extra payments for mothers (46 per cent) and fathers (48 per cent). Generally, professional women are more expensive for employers, due to the higher likelihood of career interruption, especially by taking maternity leave (Schwartz 2000). Therefore, motherhood makes women less desirable as employees (Gatrell 2006). Schwartz (2000) suggests that companies have to recognise the value of women’s productivity and high performance. Hence, there is an urgent need to retain them. In terms of maternity, professional women and superiors should build a positive working relationship and plan the return to work in advance. Flexible working arrangements are quite common and facilitate women to manage their career and their family life. Schwartz (2000) claims that flexibility is the key to success for all women who want to combine family life and career. Common types of flexibility are temporary work, place-of-work, and flexibility in working times and number of working hours (Booth et al. 2005). By providing more flexibility, employees can choose the time and location of work, and companies are more able to meet employees, needs (Johnson 2004). Researchers confirm that both employees and companies benefit from flexible working (Hill et al. 2001). For instance, companies benefit by lower overhead costs through reducing office space requirements (Stredwick et al. 2005, Thomson 2008). Moreover, flexible working gives a greater level of job satisfaction and commitment from employees (Stredwick et al. 2005), as well as improvements in performance can be expected (Dex et al. 2001, cited in Anderson et al. 2009). On the other hand, many companies face difficulties when implementing flexible working practices. This is often due to poor guidance for senior managers, a lack of responsibilities and clarity between line and human resource managers, as well as limited opportunities (Drew 2005). Anderson (et al. 2009) identified balancing flexibility and availability as a main challenge. Problems with the practice of workplace flexibility arise, if clarity of starting and finishing working days, amount of working hours or unexpected leavings for private issues is missing (Edlund 2007). Therefore, a lack of standardisation can lead to unfair treatment in companies. Additionally, a loss of managerial control and overreliance on particular employees are identified as risks in connection with flexible working (Stredwick et al. 2005). In order to ensure that individuals and organisations can benefit from flexible working, companies have to transform their culture and create a fair and equitable relationship. Therefore, instead of working long hours, the culture should be transformed into a performance and outcome orientated culture characterised by flexible working arrangements (Drew 2005). Work-life programmes support women to be productive employees. However, there is a clear need to create an accepting and supportive work environment for women through mentoring so that they can fulfil their career and family life (O’Neil et al. 2005). Moreover, it is asserted that the implementation of a family-friendly culture is crucial to achieve business success (Jones et al. 2006). Social policies are ‘encompassing programmes’ (Baldock et al. 2007, p603) with the aim of securing or enhancing employees’ wellbeing and life changes. Regardless of social policies, work-life balance is principally understood as a private issue and families have to find associated solutions. Where work-life issues in Nordic countries are a public matter and people are supported with care services for children and the elderly; in market-oriented countries such as the UK, work-life issues are mainly a private concern. Parents in market- oriented economies and continental Europe are likely to have more difficulties in balancing their work and family life, because of the lack of supportive social policies (Edlund 2007). Scandinavian countries, as opposed to other European countries, have a well developed childcare system (Straub 2007). As a result, the number of employed women is considerably higher in Nordic countries (Edlund 2007), while the number of women in management positions in continental European countries is lower (Figure 2.3). Nevertheless, other countries such as Austria or Germany offer job-protected maternity/paternity leave arrangements (Straub 2007). However, it is argued that this policy fosters women to stay at home with their children over a longer period of time instead of encouraging paid participation (Edlund 2007). According to Nyberg (2001) high quality public childcare is a key characteristic of the dual-earner model and encourages women to focus on their career. Moreover, it influences resources such as income and autonomy, and helps to combine work and family (Berkel et al. 2002). 60 per cent of female employment, provide childcare for 33 per cent of all children under the age of three years, and at least 90 per cent of all children between the age of three and mandatory school age by 2010 (Aybars 2007). Moreover, the European Commission (2006) determined a roadmap6 for equality between women and men, which includes reconciliation of private and professional life. Hence, work-life policies have gradually attracted more attention and acceptance in European countries. Nevertheless, European work-life policies have diverse responses in various countries due to differences in their welfare systems (Aybars 2007). Some countries such as Denmark are considered as pioneers of family-friendly policies. In Denmark the male bread-winner model was replaced in 1970, due to beneficial tax treatment for couples and an increase of unemployment benefits for men. Thus, the number of women in the labour market increased to 60 per cent. Additionally, a guarantee for childcare places was provided for children up to the ages of six years since 1996. Additionally, Denmark has been fostering the division of parental leave since 2002, and therefore provides child allowance, as well as different childcare opportunities such as day nurseries and childminders (Syndikus 2009). As a result, Denmark has 78.1 per cent one of the highest quotes of employment in Europe (Eurostat 2008, Figure 2.4). This chapter has provided an overview on the theme of work-life balance with a focus on women in senior management positions. It discussed individuals, organisations, and social policies, and the relationship between these respective areas. In terms of individuals, the gender gap was the main issue which was noted in division of household and childcare, as well as the number of women in leadership positions. Having evaluated the existing literature on work-life balance, the following chapter outlines the research design adopted for this current study. The primary aim of this chapter is to present the research design which has been selected to answer the research question. This chapter begins with a discussion of research methodology, followed by a discussion of research philosophy and associated approach. Then, the research strategy and the research process will be presented. The chapter will then conclude with a discussion of the importance of being aware of, ethical issues in primary research investigations. The major aim of this research is to find out how women in senior management positions combine a successful career and a satisfactory family life. Therefore, women’s working and private environments, as well as personal circumstances have to be addressed. The second objective is to observe the influence of a satisfactory work-life balance on job performance. For that reason, private relationships and professional relationships between women and superiors will be considered. Thus, different methodologies have been considered in order to identify the appropriate methodology for this research. Grounded theory could be selected, due to the general method of comparative analysis, which focuses on the generation of new hypotheses and new theories (Glaser 1980). However, the researcher found the limitation of data collection as a restriction, due to only relevant data for the theory should be collected and thereby interesting data, which could be useful for the research result, have to be ignored. Hence, the feminist study seems suitable as the right methodology, to investigate and gain better understanding of women’s work- life balances (Collis and Hussey 2009). Hyde (1994) outlined three principles which determine feminist studies. The first principle implies that knowledge is based on women’s experiences. Secondly, the research represents a benefit for women and finally, the researcher shows empathy for the study. However, following feminist studies does not exclude other types of methodology and it is also possible to combine feminist studies with other methods (Collis and Hussey 2009). Feminist methodology is not without criticism and difficulties. In general, there are concerns about the procedure of creating knowledge. Feminist methodology is based on women’s experiences, therefore, “feminists are criticized for failing to produce adequately rational, scientific or unbiased knowledge” (Ramazanoglu et al. 2002, p3). For this reason, academic communities put a huge pressure on feminists. Furthermore, Thompson (1992) discussed the nature of truth in feminist research and Gavey (1989 cited in Thompson 1992, p12) argued that “there is no absolute truth, no objectivity”; therefore, knowledge can change regarding the situation. Moreover, feminist research is criticised due to differences in women’s experiences based on differing cultural backgrounds, social divisions and power relations. On the other hand, Lorde (1979) argued that differences between women do not exist, even if there are difference in terms of ethnicity, colour, age and class. Additionally, Gregg (1994 cited in Collis and Hussey 2009) outlined difficulties, when a researcher has different values and holds on to another opinion than the participant. This could lead to a lack of acceptance of what the interviewee said. In addition, DeVault (1990) identified language barriers and argues that women find it more difficult to speak about themselves, and have more difficulties expressing themselves than men. Apart from these problems and difficulties, feminist methodology gives another perspective to research and provides insights and understanding of women’s problems (Collis and Hussey 2009). Moreover, many authors argue that feminists can help women to comprehend their experience (Thompson 1992). Thompson (1992, p4) claimed that feminists believe that personal experiences of each woman “has worth and should be understood in all its complexity and richness”. 1 EU15: from 50.8 per cent in 1997 to 60.4 per cent in 2008 (Source: Eurostat 2008). 3 Source: Syndikus 2009, p32. 4 Sample: 514 companies, which are listed as the best companies to work for. 6 The roadmap consists of the following priorities areas: 1) achieving equal economic independence between women and men, 2) enhancing reconciliation of work, private and family life, 3) promoting equal participation of women and men in decision-making, 4) eradicating gender-based violence and trafficking, 5) eliminating gender stereotypes in society and 6) promoting of gender equality outside the EU (European Commission 2006).